Carry all the gear and equipment needed to get the job done while wearing the Cobra Rigger Belt from High Speed Gear. Featuring unparalleled strength, the Cobra employs a unique construction for maximum durability. A robust base made from two layers of military-grade type 13 webbing provides the strength needed to hold all attached equipment. Each of the dual layers is coated with an industrial-strength laminate for added rigidity, strength and support. The webbing is then meticulously stitched together using five rows of high-test 138 nylon thread to create an inseparable bond that is guaranteed to withstand the harsh conditions of tactical use. Designed to offer maximum tactical functionality, an integrated interior loop lining provides secure attachment points for holsters, tactical pouches and other belt-mounted items. 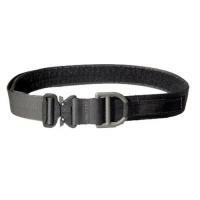 A specialized, quick-release buckle allows for rapid removal and speedy deployment of the belt. Note: High Speed Gear's® Riggers Belts are NOT certified for climbing or use as Life Saving Equipment. High quality, love the durability.